In networking terms, a device connected to a wireless network is known as a client. 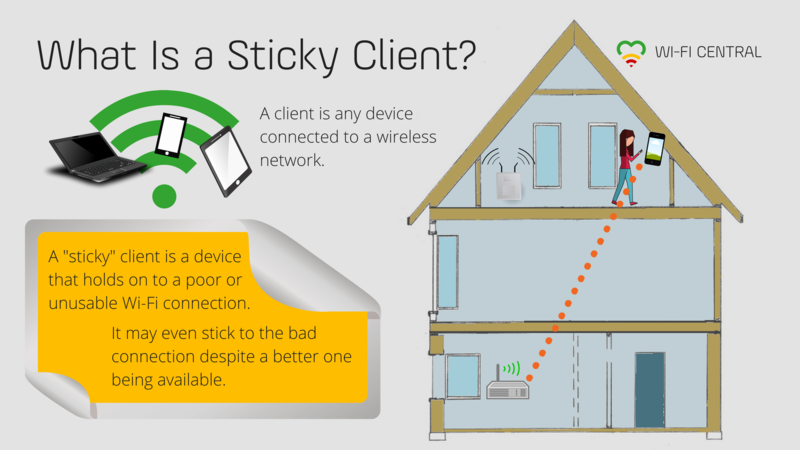 A sticky client is what you’re experiencing when your smartphone hangs on to your home Wi-Fi when you’re half way down the block and the signal is barely noticeable. When you have wireless extenders in your house, sticky client is what prevents your laptop from switching from the living room router to the much stronger signal from a nearby extender in your home office when you change rooms. When a device holds on to a useless connection, the problem is obvious: You’re not actually online. You remain on a sub-par connection, while a better one may well be available. When the connection is really poor, the device can easily become a bad apple, which will negatively impact your entire wireless network. Ideally, in an environment where more than one access point is available, every client automatically connects where it will get the best coverage and performance, which minimizes the risk of a single device dragging the entire network down, bad apple-style. An increasingly popular way to solve this is through some form of client steering. Client steering is a technology built into routers and other wireless access points that steers the each client toward the access point that can provide the best Wi-Fi performance. A common feature of client steering is band steering, which ensures that each client connects to the supported frequency band that will provide the best performance at any given time. You can read more about this in Why Band Steering Means Better Wi-Fi. Client steering and band steering features are both part of AirTies Smart Wi-Fi access points, our recommended solution for home Wi-Fi. If you’re uncertain whether your router, extender, or other wireless equipment supports client steering, consult the documentation. You can also ask the vendor or service provider you got your equipment from. Force the client to a new access point by actively changing it. Disabling and enabling Wi-Fi on the client, which will cause it to search for the strongest available signal. If you have multiple extenders in your house and no client steering, giving each access point a distinctive and easily identifiable name makes it easier to see exactly where you are connected. See How to Choose the Best SSID for Your Wi-Fi for more tips on network naming.